Liverpool overcame an early scare to close the gap to one point on Manchester City with a morale-boosting 4-2 victory against Burnley at Anfield. 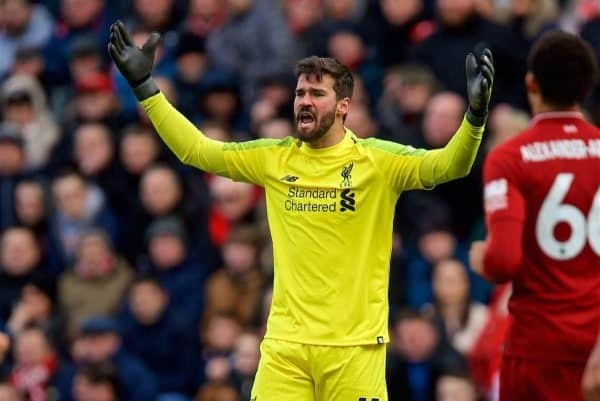 After keeping five clean sheets in a row in all competitions, Alisson was unfortunate to see his record wiped out after six minutes as James Tarkowski’s clear foul went unpunished and Ashley Westwood’s corner looped into the top corner. Relatively untroubled that moment aside, as Liverpool restricted Burnley to very few opportunities. Took few risks with his distribution, which was sensible given the influence of the wind on the flight of the ball. Made a crucial catch from a dangerous cross in stoppage time under pressure from several Burnley attackers. After his hat-trick of assists against Watford in his last showing at Anfield, Trent’s delivery wasn’t quite up to the same exceptional standard on this occasion and overhit numerous crosses from promising positions in the final third. That said, he ought to have had an assist late on as he put the ball on a plate for Sadio Mane, who somehow failed to convert inside the six-yard box with the goal gaping. Had a tough battle with the enterprising Dwight McNeil down Burnley‘s left, as the teenager posed the visitor’s most consistent threat. Following a string of impressive performances of late, Matip was sloppy early on to give away the corner which led to Burnley‘s opening goal, needlessly heading the ball out of play. Not his most convincing defensive display, and didn’t attempt any of his marauding forward runs which he has exhibited regularly of late. 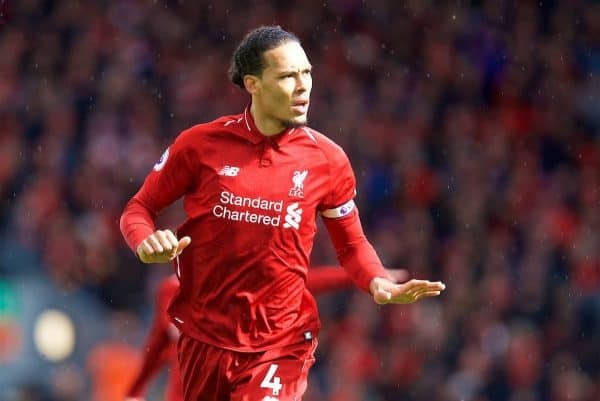 Captaining the side, Van Dijk played some excellent long-range diagonal passes during the first half to switch the play and set Liverpool on the attack, somewhat aided by the gusts of wind taking the pace off the ball. Dominated the physical tussle with Ashley Barnes and dealt well with Burnley‘s high balls into the box despite the challenging conditions. A fairly quiet game in terms of defensive work for Robertson, he repeatedly made intelligent forward runs and was unfortunate not to pick up his 11th assist of the season with a superb cross for Gini Wijnaldum in the second half. 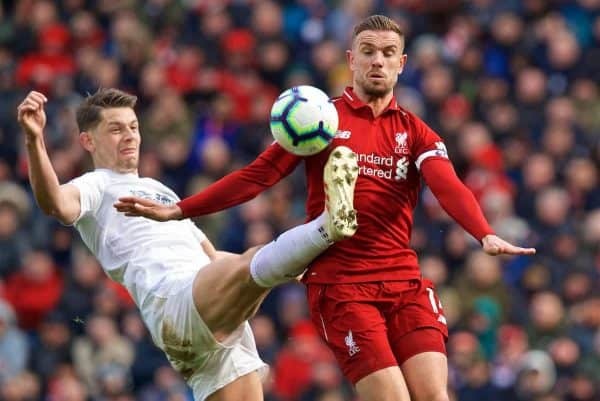 Got himself into an excellent position to open his goalscoring account for the season after arriving onto Mane’s pass, but his low driven shot was stopped by a last-ditch block by Tarkowski. Couldn’t get to the ball quick enough as Johann Berg Gudmundsson stole ahead of him in stoppage time to give Liverpool a brief scare in the final few minutes. A relatively quiet performance from the Brazilian who has been a standout performer in recent months. Not quite at his imperious best, but kept things neat and tidy for the most part in midfield, rather than attempting more ambitious passes which he is capable of—perhaps due to the conditions. Booked for a cynical foul to stop a counter-attack in the second half, but still made several important interventions to regain possession. Wijnaldum has played a huge amount of football this season and it has started to show in recent games where he hasn’t looked quite his usual self. He was quietly effective here, keeping things ticking over and using his body well to protect the ball and win his battles. His influence visibly waned in the second half, before being replaced by Henderson for the final 25 minutes—perhaps with a view of protecting him for Bayern Munich on Wednesday. 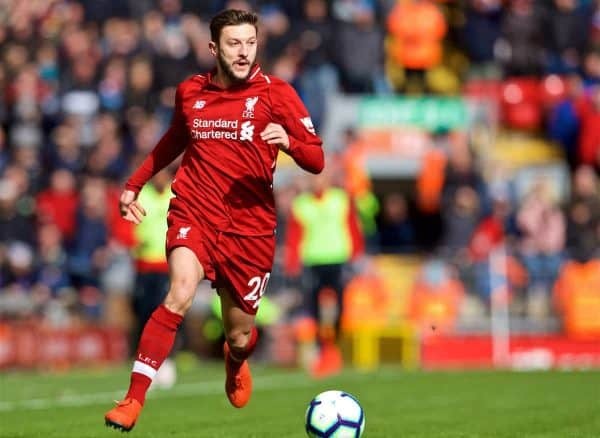 A surprise selection, making just his fourth league start of the season, Lallana was determined to justify his inclusion and showed why Jurgen Klopp still values him as an important squad member. Constantly on the front foot and picking up intelligent positions as the most advanced of Liverpool’s midfield three, it was Lallana’s pressing to charge the ball down which created the opening which led to Mane’s goal. Provided the link between midfield and attack which Liverpool have been missing in several performances recently, playing quick passing triangles and moving the ball swiftly into the front three. Looked much more like the Lallana from two years ago, and on this basis he can make an important contribution in Liverpool’s run-in. The Egyptian has endured a frustrating run of form, spurning two golden opportunities in the Merseyside derby last weekend. He was much sharper here, though, and supplied Liverpool’s equaliser with a neat one-two with Roberto Firmino, before driving to the byline and forcing it across goal for the No. 9 to tap in. Created Firmino’s second after collecting Tom Heaton’s poor clearance and bearing down on goal before a desperate last-ditch challenge left the Brazilian with a simple tap-in. Clearly desperate to end his mini goal drought, and came close on a couple of occasions, drawing a fine stop from Heaton in the final few minutes with a powerful strike which looked destined for the top corner. Returning to the side after an ankle injury, Firmino ended his run of six league games without a goal, showing smart anticipation to ensure he was on hand to prod the ball over the line from close range for Liverpool’s equaliser. 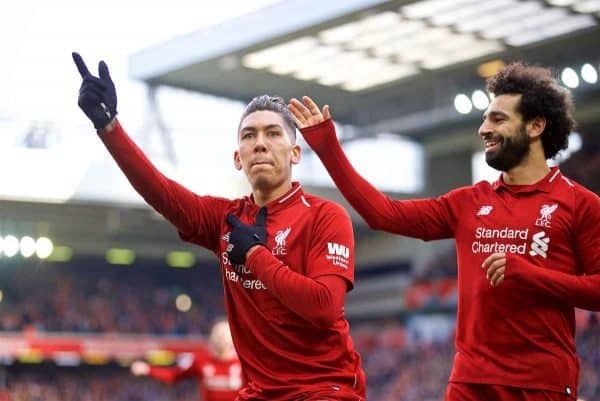 Again, Firmino was on hand to profit from Salah’s endeavours in the second half with another simple finish to put Liverpool 3-1 up, taking his tally up to 11 league goals for the season. There were positive signs of his linkup play with Mane and Salah which has been lacking in periods this season. 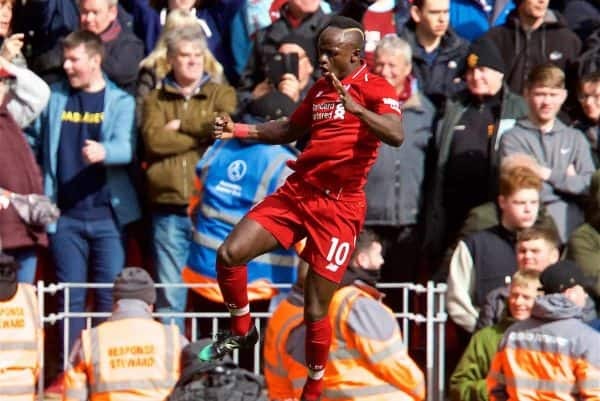 Enjoying a fine run of form in front of goal, Mane became just the fifth Liverpool player to score in six consecutive home appearances in the Premier League, with a superb, curling strike to put Liverpool in the lead just before the half-hour mark. Missed a glorious opportunity with the goal at his mercy following Alexander-Arnold’s driven cross, but made amends with his second of the afternoon, coolly rounding Heaton in stoppage time for his 50th goal for the club. Laid on several opportunities for his team-mates and was Liverpool’s most decisive attacker once again. Tracked back well to make an important challenge to stop a potentially dangerous Burnley counter-attack and helped ensure Liverpool maintained their control in the final stages of the contest. A superb piece of harrying to dispossess Gudmundsson in the final stages and release Salah. Could consider himself unfortunate not to start here, but looked bright in his brief cameo performance. Delivered a lovely through-ball assist for Mane’s stoppage-time goal to kill the game. Many fans expressed their concerns over the manager’s team selection, most notably with the inclusion of Lallana in the starting lineup ahead of Keita and Xherdan Shaqiri. His faith in Lallana was rewarded, however, as the Englishman was particularly effective in the first half, charging the ball down in the buildup to Mane’s goal which put Liverpool 2-1 up. His substitutes largely worked well, with Henderson imposing himself on proceedings while giving Wijnaldum a breather, and Sturridge came off the bench to assist Mane’s second of the afternoon. 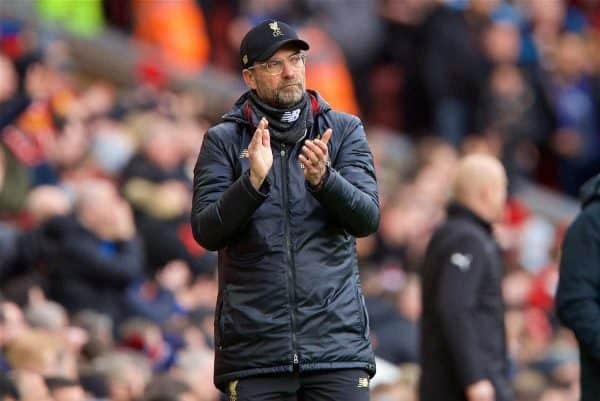 He will be delighted with the manner in which his team responded to the early setback of Burnley‘s opener, as they demonstrated a mental resilience to withstand the pressure and claw their way back in front. With a trip to Bayern before next Sunday’s game against Fulham, Klopp will be keen to rebuild some of the lost momentum from recent weeks—and this was the perfect way to start that process.